THERE has been universal approval to the news the vacant Dunnes Stores site on Sarsfield Street is to be developed into a state-of-the art, multi-storey campus by the University of Limerick. It will says the univesity, become the home of a “very different educational experience” in the heart of the city. Limerick’s business leaders, academics, public representatives and pressure groups have heralded the “historic” news of the new development at the long vacant site as the catalyst that will ‘breathe new life’ into the heart of the city centre. Last Friday, the UL Governing Authority agreed to purchase the site, which stretches from Sarsfield Street and includes Honan’s Quay and Liddy Street, for €8 million. 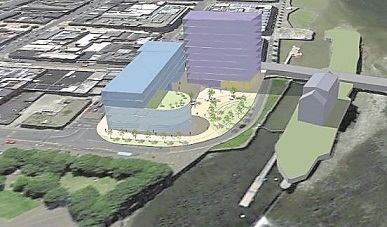 The decision to develop the riverside campus, which is expected to bring up to 2,000 students and 100 staff to the block next to Arthur’s Quay Park, is to ensure the university develops close ties with the city’s business community, according to the UL president Dr Des Fitzgerald. “UL also chose to develop the Dunnes site so that we are part of the regeneration of this wonderful city, and that we fully embrace all this city has to offer our students and staff,” Dr Fitzgerald told the Limerick Leader. The development, which the Leader understands could eventually stand as tall as eight storeys, will become the home of the ‘Future Skills Academy’, Dr Fitzgerald explained. “It builds on UL’s current research and education programmes in maths, engineering, digital technologies, data analytics, artificial intelligence, robotics, and other types of automation,” he said. A centre for graduate education in business technology, the new campus will be home to several disciplines including business, law, design and technology, he added. As of now, the university does not have a set date in terms of when a planning application for the project (an artist's impression of which you can see above) will be submitted, a UL spokesperson confirmed. A date for construction on the new campus has also yet to be set. Firm decisions on the site, like if the current buildings will be demolished, have yet to be made as plans are still under development. However, the Leader understands that there has been discussion about refurbishing the existing building and putting it into immediate use. The Leader also understands the university is set to take possession of the site, officially, late next month. An estimated budget for the project has also yet to be announced. There are a number of options for funding the development of the city centre campus, but it is likely to come from a combination of public funds, borrowings against future income and annual recurrent expenditure, a UL spokesperson confirmed. While the university had previously signalled its interest in developing the campus at the €180m Project Opera development at Patrick Street, UL has since confirmed that, for now, it is focusing on developing the Dunnes site. “We continue to engage with Limerick Twenty-Thirty and will work in tandem to explore mutually beneficial opportunities,” the spokesperson said. Limerick Twenty-Thirty, which recently saw its first major commercial development open at the Gardens International on Henry Street, has warmly welcomed the university’s commitment to the city. “It will transform the core of Limerick to a bustling, vibrant city centre,” chief executive David Conway said. “This development, together with what we have done already at Gardens International, our plans for the Opera as well as Cleeves, is going to be absolutely transformational for Limerick. “Limerick will in a few short years be unrecognisable from the place it was, certainly in the last decade. Any modern European city centre has a university present, adding an energetic pulse and further creativity,” said Mr Conway. Limerick Chamber of Commerce was also “delighted” to hear news of the announcement, according to chief executive Dee Ryan. “This for me, with that real heart of the city location, that is going to be a game changer for the city. It is going to breathe new life into the city centre. “It is such an important announcement for us. The future development will tackle two of the major issues business owners in the city were experiencing,” she explained. The project will also boost footfall, she added. “I​f you look at the other cities identified under the Government’s national planning framework, as the engines for growth for the economy, they are talking about the city regions like Waterford, Galway, Cork and Limerick. “Everybody else has a strong student presence in their city centres. While Mary Immaculate College and the Limerick Institute of Technology are within the city limits, they are a little bit on the edges of it so we don’t get that footfall on O’Connell Street, like you would see in the equivalent main streets of the other cities,” she said.